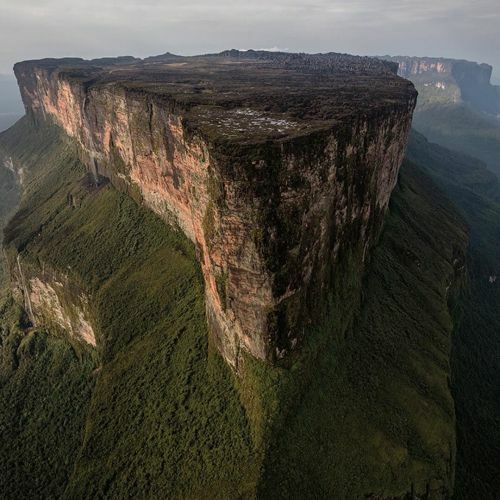 "An aerial view of the ''prow'' of Mount #Roraima, one of the most spectacular tepuis, or mesas, in #Canaima National Park. The photographer @georgesteinmetz, who is known for his #aerial photos, traveled to Venezuela to meet a friend who manages a private airport in Caracas. "He offered to take me to Angel Falls and around the tepuis in the southern part of the country," @georgesteinmetz writes for #NYTMag. "He had a Cessna 206, which you can fly with the rear cargo door open, so it's perfect for #aerial photos." He hired two bush pilots. "They wore the planes; it was like ballet," he said. "At one point, they were flying so low, they were practically washing the wheels in the river." This photo appears in #NYTMag's Voyages issue. See more: nytimes.com/instagram." By nytimes on Instagram.